off-the-beaten-path robbery "blind spot" overnight. Less than 72 hours after Mayor Rahm Emanuel told the media that his son had been robbed in a “blind spot” on the family’s Lakeview street—and promised to have the police department address such “blind spots” across the city—a man was beaten and robbed just yards from Wrigley Field. The -7° temperature did nothing to dissuade two men from performing our neighborhood’s first mugging of the new year, pummeling a Boystown resident and taking his phone, book bag, and wallet near Waveland and Sheffield at 1:45 this morning. 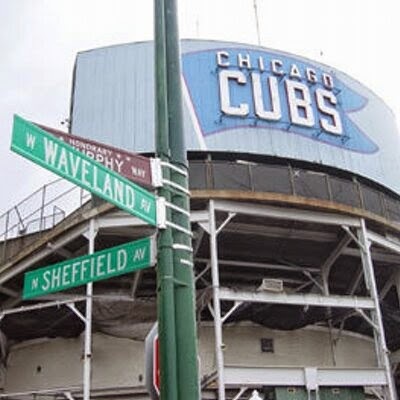 The two offenders, who brazenly exploited the unlikely “blind spot” just yards from a Major League Baseball stadium, were last seen running eastbound on Waveland. After searching the area with officers, the victim told police that he wanted to start canceling his credit cards and promised to file a report at the police station later today. Suspect descriptions: two “young” black males wearing gray or white jackets. There has been at least one notable change on Mayor Emanuel's block since the Chicago Police Department began their "blind spot" initiative. The 19th district's second-in-command now personally checks conditions on the 4200 block of Hermitage at least once daily. He's going to be a busy man if he has to patrol all of this year's blind spots alone. (1) Black male, 5’10” to 6-feet tall, 150 to 170 pounds, wearing a black jacket. (2) Male, 5’7” to 6-feet tall, 150 to 170 pounds.